We use our showers frequently throughout the week to get clean and rid our bodies of dirt, dead skin cells, and whatever else. When we walk out of the shower we feel refreshed, rejuvenated, and ready to start our day/night. However, our showers are not left with the same feeling. While we wash our bodies with soap to get clean, our showers are regularly drenched with dirt and grime that can become gunked on and be tough to get out. Sooner or later the white tub we use to know is now dull and stained. Instead of spending tons of money on cleaning products that need intensive scrubbing to even slightly work, use the following household products to return you tub to its former glory! This stuff works wonders for whitening and cleaning. Sprinkling some on a toothbrush for a whiter smile or placing a box in your fridge to keep it smelling fresh, baking soda can get anything whiter and cleaner, and it is about to do it for your tub! You can make any sized mixture you want by using two parts baking soda and 1 part hydrogen peroxide. Cover the tub evenly with the paste and let sit 30 to 45 minutes. Scrub well and rinse off! Just like baking soda, mixing cream of tartar with hydrogen peroxide can get rid of stains with little to no effort! You’ll want to use a shallow cup or bowl depending on how much you need and fill it with one to four cups of tartar. Then slowly add in the peroxide until it creates a thick paste. Cover the tub with the paste and let it completely dry. Remove with water. Another household item with excellent uses, vinegar, restores the shine and glimmer your tub can have after a nice clean. Simply pour three cups of vinegar in hot running water and have the tub fill up. Soak the tub for four hours. Drain the tub and the stains will scrub off with ease! 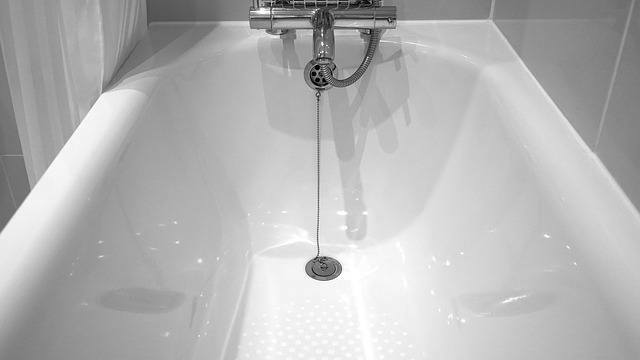 Having an enamel bathtub can have some of the toughest stains, yellow spots. Most cleaning tricks just don’t seem to work. To solve this, use equal parts of salt and turpentine and make into a solution. Ventilate your bathroom if you use this method. Rub this mixture onto the yellowed areas wearing rubber gloves. Rinse with water and the discoloration should be solved!